Well I am sure there are some sore heads in Dublin, Paris and Edinburgh for all manner of reasons after the games this past weekend. The first selection for Team of the Round certainly has more than a rose tinted look to it with not a bit of green in sight. 15. Liam Williams (WAL) Failed to top off his performance with a try but provided great attacking thrust when Wales were struggling , edges Elliot Daly's cultured left boot. 14. Jonny May (ENG) Explosive start and was a thorn in Ireland's side all day , selfless chasing and constant threat ball in hand too. 13. Henry Slade (ENG) His best outing at this level, passing was top notch and probing kicks kept Ireland pegged back. 12. Wesley Fofana (FRA) Was at the heart of everything good France did on Friday night, Manu Tuilagi and Jonathan Davies also showed well. 11. Blair Kinghorn (SCO) Hat trick scorer and could've had more if Scotland hadn't hit a few speed bumps in the 2nd half. 10. Owen Farrell (ENG) Composed and measured performance, put England in right areas consistently and varied his game nicely. 9. Ben Youngs (ENG) Another to produce his best performance in a white jersey, excellent box kicks and kept bringing his carriers onto the ball , lucky to start but totally justified Jones' faith in him. 8. Billy Vunipola (ENG) Still not the beast before the arm breaks, but always took multiple defenders to stop him, freeing space elsewhere. Louis Picamoles rolled back the years in Paris with a strong game. 7. Tom Curry (ENG) A menace at the breakdown and in the tackle area, an aggressive (at times overly) outing for the Sale man. 6. Ross Moriarty (WAL) Slight change of position from his match day shirt. Another back to his best after time out , big carries and tackles to get Wales back into the game after a poor 1st half. 5. Maro Itoje (ENG) A supreme athlete and top class performer especially when he isn't conceding silly penalties , his injury may hurt England in the future. 4. Artur Iturria (FRA) Another who wears a different number from the one he wore during the game, conspicuous in attack and defence, his sumptuous offloads see him secure one of the lock roles, where he is experienced. 3.Tomas Francis (WAL) Part of a significantly lighter yet dominant Welsh scrum , which probably deserved a penalty or two more , Kyle Sinckler also impressed. 2. Jamie George (ENG) A solid rather than spectacular outing , did his basics well , expect more carrying as game time stacks up. 1. 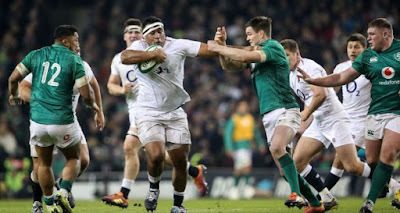 Mako Vunipola (ENG) MotM performance , huge stats don't always mean huge impact but his do and added to his improved scrummaging a vital player for the English. So representatives from 4 of the 6 nations , here's hoping some green appears next week.